Hello everybody. This was a very busy week for me. I sadly was not able to completely finish the game this time, but the last two times, I didn't submit anything, so this is an improvement. I went with a simple idea but I still did not have enough time to implement and do everything I wanted. There is just the main game loop with a score counter and asteroids, two planets and the players' spaceship. I have a 40 hour work week (where I also code, it is my job), but this week I had to do more than 40 hours :(. I am not complaining about my work, I like programming, yes, even at work, but it was too much this time, and I've got other things I need to take care of, too. Basically, in this game, you control a spaceship with your arrow keys and you have to shoot bullets at asteroids (using the spacebar) in order to destroy them before they collide with one of the two planets. If you collide with an asteroid, or if an asteroid collides with a planet, the game is over. Shooting and destroying asteroids gives you 5 points. I am not sure whether I should participate next time. Maybe somebody wants to team up with me next time, or I would also be willing to join a team next time, so we can share some work, and don't have to do everything on our own. I am making some progress, finally. I've got two planets (two worlds) and a space background, yay! 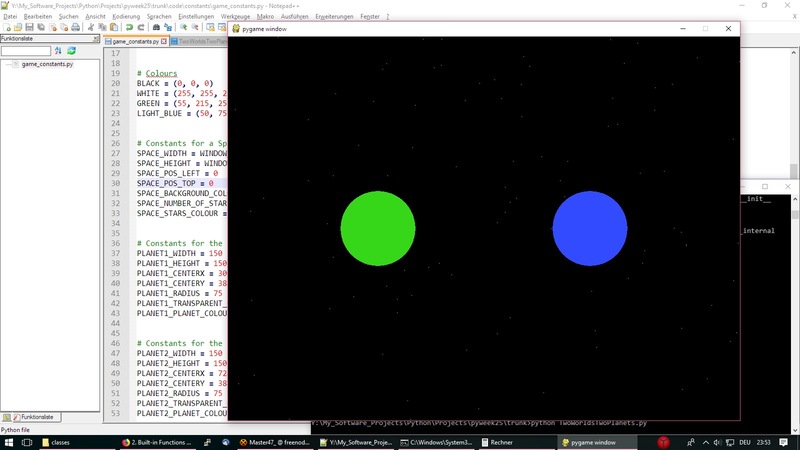 Tomorrow, I will create the spaceship with the cannon which the player can control to shoot meteors/asteroids. 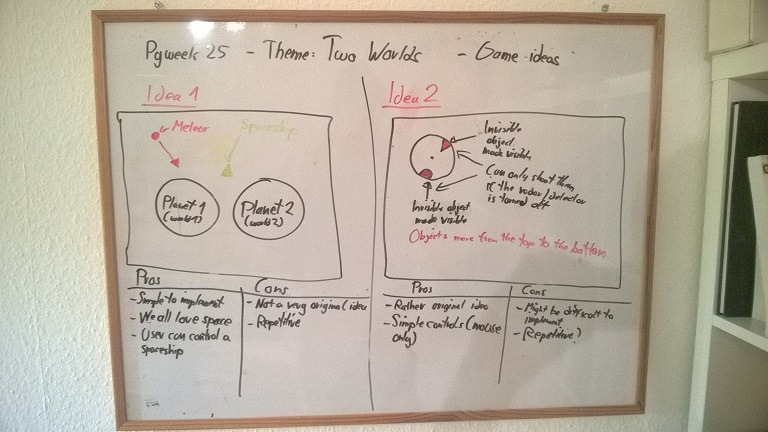 I've been brainstorming for about 2-3 hours on what I could make, and I came up with two game ideas for the "Two Worlds" theme. 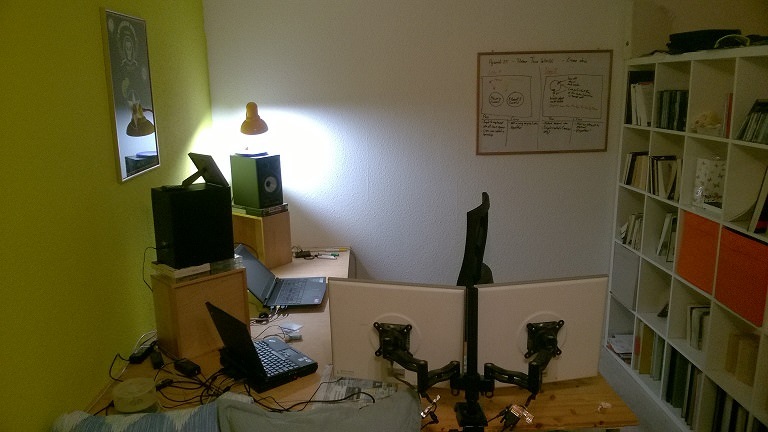 Here are two pictures, one showing my programming / music prod workspace and the other one the whiteboard with the two game ideas. I think I will go for idea 1, because it sounds more interesting to me. Basically, both ideas are shoot-em-ups, idea one is about defending two planets (two worlds) against a meteor shower for a certain amount of time. Idea two is about defending robots or something like that from entering somewhere. To detect the robots, one needs to use the radar, but to shoot them, you have to turn off the radar. And where is the theme in that? Well, there is the visible world, where you shoot the objects and the invisible world, which is being made visible by using a special radar.